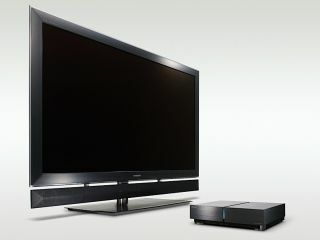 Toshiba has announced that it is fully integrating its TV range into the 3D world, with the news that its much-publicised, not-yet-released Cell TV will offer the "ultimate 3D experience" when it comes to 3D in the home. Toshiba seems to be fully committed to 3D, with announcement at CES that it plans to introduce the technology into its REGZA line-up of Full-HD LCD TVs in 2010, using RealD 3D technology. But while it pushes its REGZA range into another dimension for the average consumer, those who are looking for premium quality will be pleased to hear that Toshiba also revealed that its upcoming Cell TV, which it is calling a device that goes "beyond TV", will allow real-time conversion of 2D content into 3D. So even if the three-dimensional content isn't that forthcoming in 2010, you'll be able to watch football games and the like in 3D on the Cell TV. Speaking at the Toshiba CES 2010 press conference, with TechRadar in attendance, Scott Ramirez, Vice President of Marketing for the TV group, explained: "For consumers, Toshiba will deliver the ultimate 3D experience to the home in 2010, this is because Cell TV has a unique ability to change 2D content to 3D in real-time." The technology used by Toshiba to make this conversion happen is called Tri-Vector real-time technology, which allows a 480Hz picture in 2D mode to be piped to each eye at 240Hz as the action happens, with no lag whatsoever. "You'll be able to watch everything in 3D," explained Ramirez. "2D TV, home movies, videogames – the Cell TV makes 3DTV usable every day, from day one." Toshiba is trying its best to stand out from the 3D crown. With 3D announcements from Sony, Panasonic, LG and Sony already it seems that the whole of the AV world is finally switched on to getting 3D into the homes. Ramirez isn't fazed by competition, though, notes somewhat bullishly: "In a year when 3D is so important the Cell TV stands out."